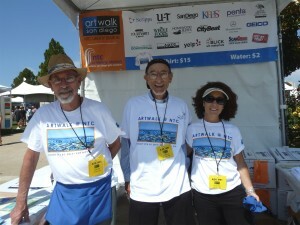 You must be at least 16 years old to volunteer for ArtWalk Carlsbad. Our volunteer sign up page will be linked here in the late spring. ArtWalk volunteers receive a complimentary event t-shirt, refreshments and the opportunity to buy ArtWalk merchandise at a reduced price and the chance to be part of another great ArtWalk event. Duties may include flyer and poster distribution, assisting with event setup & strike, conducting surveys, assisting visitors and artists, traffic control, staffing water booths, floaters, table tenders and assisting ArtWalk staff with various projects.